Raw wildflower honey in a 2.5 pound container. Raw honey has not been heated and simply filtered through a large mesh screen. The screen removes larger particles and allows pollen, propolis and beeswax particles to pass through it. Wildflower honey is exactly what it sounds like. Derived from a variety of wildflowers and plants which are blooming during the summer months. It's a thicker honey and the taste varies from year to year based on what's in bloom. This honey has a delightful taste and is darker in color. Darker honey has more vitamins, minerals, and antioxidant properties compared to lighter honey. The taste and consistency of this honey is amazing. Great in tea, or by the spoonful. Service can't be beat. 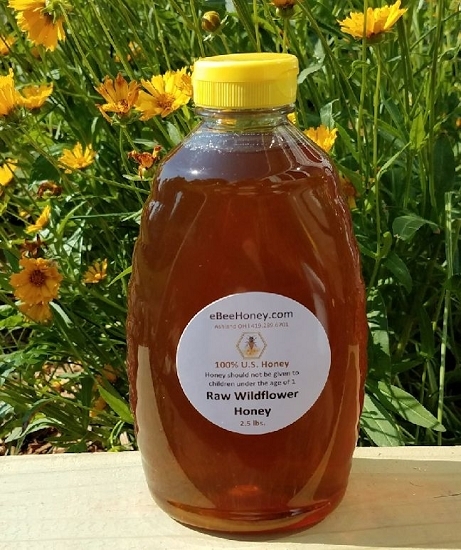 The raw wildflower honey is one of our favorites. We like the darker color and the slightly bolder honey flavor. Great quality and customer service, fast shipping....consistent and always meets our expectations. Thank You! We have been buying raw honey at ebeehoney since couple of years.Every time we received great quality raw honey at great price! Also,they shipped the items right on time!We are so blessed to have this great source to buy local honey.. This product arrived quickly, the cost was reasonable and the taste is wonderful. I would recommend this honey to all. Yummy yum yum yum, what else is there to say? Oh my! Having a honey binge, wonderful wildflower honey. Wonderful product! I love their honey products, and will buy from again, and again! I started off with the sampler to taste a lot of varieties. Decided on this one because I love the flavor and the thickness. Not only do I eat the honey, but I also use it on my face and for medicinal dog remedies. 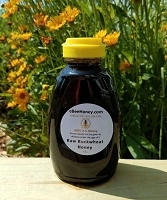 The fact that it is not heated and not overly strained makes this honey delicious and beneficial in so many different ways. You have a customer for life!! Thank you for making it so great and still keeping it in an average person's price range!! Good, natural product, with out any adding. Love it. I received my order in a short period of time. Very good delivery time. I really have really enjoyed the honey, especially on homemade biscuits. A great honey. Wildflower is probably my favorite tasting honey and this does not disappoint! I like raw honey for the additional heal benefits and it's great to buy local ( for me). This company knows their product and how to provide great customer service. Shipping is fast! Best tasting honey yet! Love that it is from Ohio! Have been purchasing this honey for approximately two years now. I love it! Wonderful taste! I've also started experimenting recently with using it for skin care. Is working great for that as well. Raw honey is very good for you. It has a lot of trace minerals and other nutritional factors. I have been purchasing honey from ebee honey for years and their honey is always good. I've never had a complaint. Buy raw honey from these people because you can't get this in the stores. I love having honey to put on my toast or for a recipe I am baking. I tried few brands but seems to have an after taste. I bought this honey and hoped for the best. This honey delivered and tasted so delicious!! I was so excited! Thank you so much and both of my items delivered so quickly. # besthoneyever!! I have been surprised at how much variation in the honeys from various flower sources have. 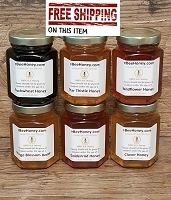 To me, the wildflower honey tastes reminiscent of berries, and though the product description says it's a thicker honey, I found it was thinner and more fast running compared to the other raw honeys I have tried. They are all delicious, and I have loved all of them I have tried. I now have a new honey provider! The Raw Wildflower Honey is golden and just a little bit thick, which I love. It has a sweet, deep flavor with just a slight twang-perfect honey! I put this on my plain Greek yogurt, in my tea, and will even just eat a spoonful. Thank you eBeeHoney and the Bees :) We love your honey!!!! We just love the flavor of this wildflower honey to put in our oatmeal or into our yogurt. It's fragrant, smooth flavor is perfect. Also perfect to sweeten a cup of tea. I would have to say the wildflower honey is our favorite! I buy a lot of raw honey and it's usually cloudy and very thick. This honey was liquid and clear. 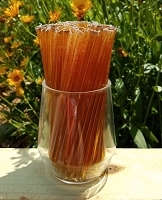 It has a fantastic flavor and is sweeter than most of the honey I've used recently which means I can use less. I definitely recommend this raw wildflower honey! I think I might have a new favorite over orange blossom. It's a tough call, so try some and you'll see how good it is. This is a very tasty honey! It has great depth to the flavor. I like how this honey lingers on the taste buds :-) This is my second year buying Wildflower honey from EBeeHoney and am quite pleased! I love this honey! I had forgotten what real honey tasted like and will never go back to the store "honey bear" again. Thank you for such a wonderful product. Loved the flavor of this honey! YUMMY! I decided to try raw honey as an additive to a homeopathic cough syrup, but wow, is it delicious! Not sure what I was expecting, but this has taken over as our daily sweetener for tea, etc. Really fast shipping, love it! Great flavor and fast service. I've cleaned out our local honey supplier for the year, so I had to look elsewhere. This honey is so wonderful tasting, beautiful color and so delicious. Will bee :) buying again. This is my first raw honey purchase and I'm hooked! Beautiful color and flavor, packaging and delivery time was perfect. I use it in my tea, on toast and take a spoonful with ceylon cinnamon twice a day. I will certainly be ordering again! Mild sweet with an almost fruity flavor. This honey works well for everything from adding a little sweet flavor to tea & oatmeal, or as a topping for biscuits or ice cream. I drink green tea with honey. Sometimes it is hard to purchase a raw honey that is mild enough to not overpower the delicate flavor of the green tea. The raw wildflower honey you provide is excellent! An excellent sweetener that will not detract from the flavor of your main ingredient. Thank you. I was searching for some very good raw honey to replace sugar in our diet, what I got was incredibly delicious raw honey!!! We are so impressed with quality and flavor! So glad we found ebeehoney! This is the best honey I've tasted so far. Is a lot better than even the locally produced honey. I like it a lot. So far so good. Hoping that it will help with my allergies like the honey did in florida. I have been purchasing from Ebee for over a year now. I am very pleased in the quality of all their raw honeys. I bought this because my children love this kind. It helps a lot that they sell the honey in larger containers also. I ordered this just to get some raw honey. I absolutley love it. I put it in my oatmeal and on pancakes. I even put a little bit of it as a flavor in my homemade chapstick and its great! It tastes similar to the honey that McDonalds has. I have tried other Wildflower honey,I know every honey is different but I totally love this one. I will purchase larger quantities when I get back to Florida in December. This is simply liqued gold.A sweet, light flavor. Almost ethereal in flavor. I just love it, and use it in my coffee, and anywhere else I want something sweet. Well worth the price! I really like the taste of this honey. Its not as strong as Buckwheat in taste but is still a dark honey so it has all the goodness you want. I like to think all the wildflowers each give you its own protective properties. You can''t go wrong with this flavor. This honey is very good. It is sweet and has a pleasingly robust flavor, meaning it is not a weaker flavor like Orange Blossom Honey. Orange Blossom is very good but is just a milder taste. This honey is one of my favorites. The other favorite is Star Thistle Honey. Love this company. 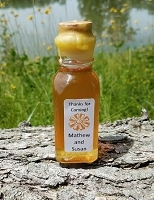 The raw wildflower honey provides a really nice balance between a mild and strong honey. I use this for everything. My wife loves it too. We went through the 2.5lbs pretty quickly so I''m going to reorder 5lbs.